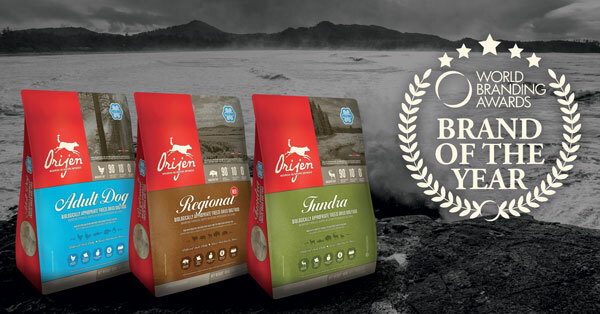 ORIJEN Freeze-Dried Dog Food has been named Brand of the Year 2017 – 2018 in the Global awards tier at the World Branding Forum in Vienna. Over 800 brands from 35 countries were nominated for the 2017-2018 Animalis Edition of the Awards in multiple categories, and more than 60,000 consumers from around the world participated during the voting period. The award recognizes brands with a presence in 10 or more countries across three or more continents. Unlike conventional pet foods, which are cooked at high temperatures, ORIJEN Freeze-Dried foods are prepared without cooking with the aim of retaining ‘the natural properties of authentically fresh ingredients’. This award puts Champion Petfoods in league with other Global award winners such as Facebook, Google, Coca-Cola and Apple, and is a sign of how far their commitment to Pet Lovers has taken them – and will continue to take them.